Welcome to this week’s knitting freebie! 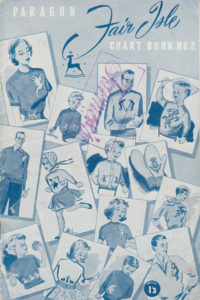 Another booklet of vintage knitting charts from Paragon New Zealand. Paragon Fair-Isle Chart Book No 2. This booklet contains black and white charts for small, medium and large designs. As with the original Paragon Fair-Isle Chart Book, I have added the charts in colour, and users of DesignaKnit software can also download them in DAK format.